Here is the leaflet for the initiative “Solar Solutions for the Future”. It is one of the most interesting initiatives I have worked with and think it will contribute some significant changes in the near future. The initiative “Solar Solutions for the Future” will support all solutions that move society toward a sustainable solar-based energy system. It will highlight efforts in all major sectors and will not be limited to the industries typically included in the solar sector. Solar Solutions is not about a specific company, sector, or technology; it’s a paradigm shift. Everyone can win by supporting Solar Solutions for the Future. Many stakeholders have expressed the need for a platform where information and best practices can be shared. Solar Solutions for the Future will use innovative digital tools to meet this need, in collaboration with stakeholders. The 21st Century Solar Map is a Web 2.0 platform to support the accelerated uptake of solar solutions by cities and companies. The platform will be open to all stakeholders supporting an accelerated uptake of solar solutions. Climate Change and energy security are two of the greatest challenges of the 21st century. Reducing CO2 emissions and dependence on fossil fuels is a challenge but also an opportunity for those who can provide solutions. The cities and companies that are successful in implementing solar solutions will be winners in the 21st century. Solar solutions present a historic opportunity to support job creation and innovation, as well as CO2 reductions and a sustainable economy. 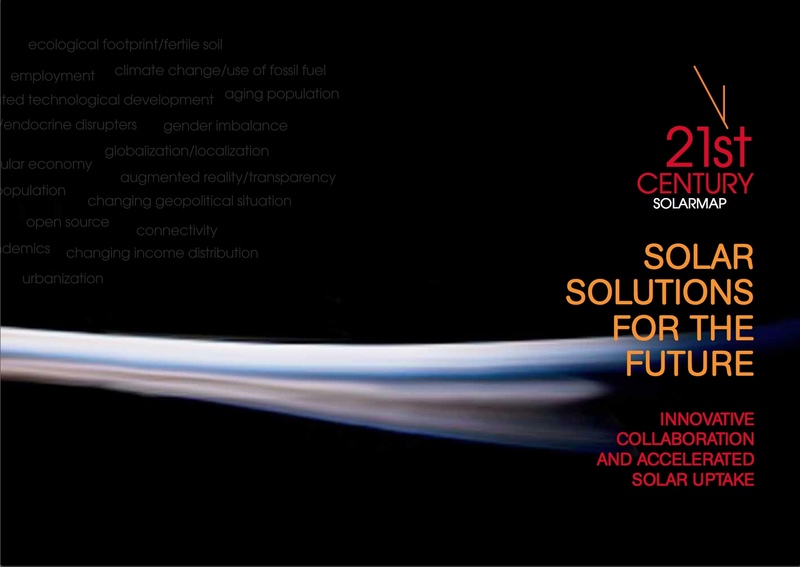 This opportunity could be leveraged by the implementation of a 21st Century Solar Map using cutting-edge web solutions.